Socialization is introducing your puppy to the world he will inhabit and helping him to make good associations with people, places and things. This includes kids, dogs and other animals, car rides, surfaces, sounds, and outside environments. The critical period for socialization is the first 4-16 weeks of a puppy’s life. By about 5 months this window begins to close as a puppy goes through a “fear period” and is much less accepting of new things. A reputable breeder will begin the socialization of puppies before they leave the litter. Puppy mill puppies can wind up in a pet store or farmer’s market at about 6 weeks of age and spend this critical time in a cage. Puppy Classes should be started as early as possible. PetSmart Puppy Classes are for puppies 10 weeks to 5 months of age. Unfortunately, many veterinarians tell people to keep their puppy isolated until he has received all his shots (5 or 6 months of age). Lack of proper socialization is more of a risk to a dog’s life than the minimal disease risk to a healthy puppy. The reason most dogs are surrendered to shelters is aggression or behavior problems which result from lack of proper socialization and training. 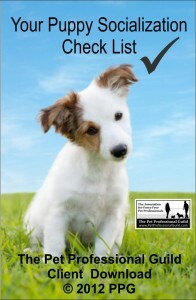 Before You Get Your Puppy – This book is simply a MUST READ for anyone thinking of getting a puppy. Puppies should be raised in an errorless housetraining and chewtoy-training set-up. This is very easy to do and everything you need to know is described in this little book. After You Get Your Puppy – This book covers housesoiling, destructive chewing, barking, separation anxiety, socialization, handling, puppy biting, bite-inhibition and preventing adolescent problems. If you are adding a puppy to your family, please take advantage of these free resources and get him started off the right way. A puppy should be a family member for life!